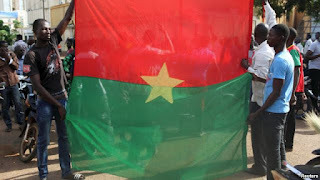 The leader and chief negotiator of the Confederation of Labor Unions in Burkina Faso said the West African economic regional bloc Economic Community of West African States (ECOWAS) is partly to blame for the political and military crisis in Burkina Faso. Bazie Bassolma told VOA Tuesday ECOWAS should not force the Burkinabe people to negotiate with the coup leaders, who he said have been characterized by the African Union as terrorists. His comments came as West African leaders who met Tuesday in the Nigerian capital, Abuja, announced they are sending a new peace mission to Burkina Faso Wednesday. ECOWAS Commission President Kadre Desire Ouedraogo said one purpose of the new delegation is "to re-establish Michel Kafando” as transitional president. He also said the delegation, which comprises Nigeria, Niger, Togo, Ghana, Benin and Senegal, will "initiate a political dialogue among all stakeholders with a view to finding concessional solutions" to the proposed ECOWAS peace plan. But labor unions leader and chief negotiator Bassolma said the Burkinabe people will not negotiate with what he called "terrorists." “Our position is this: We say that ECOWAS is also part of the problem in our country because we see the presidents of ECOWAS tried to discuss with terrorists in our country,” he said. Bassolma said by holding discussions with the coup leaders, ECOWAS is in reality saying that the people’s transitional government led by Michel Kafando is null and void. “We say we are fighting for peace in our country; we are fighting for our rights in our country. But we cannot accept that ECOWAS comes to our country to negotiate with terrorists,” Bassolma said. In addition to reestablishing Kafando, Ouedraogo said Tuesday that another purpose of the delegation is "initiate a political dialogue among all stakeholders with a view to finding concessional solutions" to the proposed ECOWAS peace plan. 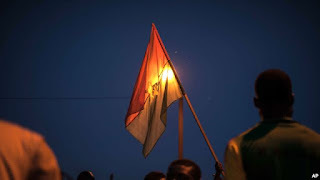 The first round of talks mediated by Senegalese President Mackey Sall focused on returning power to the interim government while offering amnesty to the coup leaders. The deal would also have allowed for pro-Compaore candidates, who had been excluded from the October 11 elections, to take part in coming elections. The presidential guard overthrew Burkina Faso's transitional government last Wednesday less than a month before elections. Coup leader General Gilbert Diendere said the polls were "biased," because supporters of former president Blaise Compaore were barred from running. Diendere has said he will hand over power when requested by West African leaders from ECOWAS. Bassolma said the Burkinabe people agree with ECOWAS that the deposed transitional government should be returned to power and lead the country to election. But he said granting amnesty to the coup leaders is out of the question. “We said that we want the transitional government take back its road. We think that this group of military must go back to the barracks. We cannot accept that one party of this army takes our country on a dangerous road,” he said. He said civil society will never grant amnesty to the coup leaders because they have the Burkinabe people’s blood on their hands. “We cannot accept that terrorists killed many people and now want to get amnesty. We will not accept [it],” Bassolma said.